View Poll Results: A cuál le dan uds? ¿Cómo dijo? ¿Que el orden mundial "cambia" y que era China quien iba a sancionar a EE.UU.? Me pregunto que dirán los defensores a ultranza del "derecho internacional" respecto de este fallo histórico. Seguramente que China patee el tablero ante el fallo del tribunal internacional (como lo ha hecho desconociéndolo y reafirmando sus derechos de soberanía, descartados por "carecer de base legal alguna"), la crisis y la amenaza de un conflicto armado que puedan surgir a partir de ello también van a ser culpa de Estados Unidos. Este es un fallo -en mi opinión- de caracter histórico pues deja en claro la ilegalidad patente de la continua agresión territorial china (esa misma que connotados foristas en esta casa han defendido y hasta celebrado). La Corte Permanente de Arbitrajes de La Haya es clara en su fallo que las actividades de expansión china en el South China Sea constituyen violaciones de numerosas partes del tratado UNCLOS (United Nations Convention on the Law of the Sea) de 1982. A saber, estos abusos hacia vecinos más pequeños -que repito, acá varios han defendido y hasta celebrado- comprenden la explotación pesquera ilegal, la instalación de bases militares en islotes artificiales emplazados en aguas ajenas, actos hostiles hacia flotas foráneas (incluyendo intentos de dañar aparejos de pesca e hidrófonos) y maniobras hostiles -francamente irresponsables- hacia buques y aviones en tránsito. The international Permanent Court of Arbitration today found China in violation of numerous parts of the 1982 United Nations Convention on the Law of the Sea (UNCLOS), capping a case filed by the Philippines in 2013 over territorial disputes in the South China Sea. The arbitration filed by the Philippines before the court, based in The Hague, Netherlands, concerned the role of historic rights and the source of maritime entitlements in the South China Sea. China has cited ancient maps and documents that allegedly indicate historic precedence to dominate and control an area roughly the size of India. The Hague ruled that to the extent that China had historic rights to resources in the waters of the South China Sea, such rights were extinguished when incompatible with the exclusive economic zones (EEZ) set out in the UNCLOS text. The tribunal also noted that while navigators and fishermen from China and elsewhere had historically made use of the islands, there was no evidence that China had historically exercised exclusive control over the waters or their resources. The Hague concluded that there was no legal basis for China to claim historic rights to resources within the sea areas falling within the nine-dash line that China uses to claim the entirety of the South China Sea. The court also examined the status of certain maritime features and their requisite maritime entitlements, and the lawfulness of certain actions by China that were alleged by the Philippines to violate UNCLOS. China has been involved in an aggressive land-reclamation effort in the South China Sea and has installed both civilian and military facilities on these sites. The tribunal concluded that none of the Spratly Islands is capable of generating extended maritime zones due to their natural setting, including submersion during high tide. “Having found that none of the features claimed by China was capable of generating an exclusive economic zone, the Tribunal found that it could—without delimiting a boundary—declare that certain sea areas are within the exclusive economic zone of the Philippines, because those areas are not overlapped by any possible entitlement of China,” the court said. The Hague also considered the lawfulness of Chinese actions particularly in areas within the EEZ of the Philippines. The court found that China had violated the Philippines’ sovereign rights in its EEZ by interfering with Philippine fishing and petroleum exploration, constructing artificial islands and failing to prevent Chinese fishermen from fishing in the zone. Sam Tangredi, a specialist on anti-access/area denial (A2/AD) strategies at the US-based consulting firm Strategic Insight, argues that China's A2/AD ambitions must be defined in terms of diplomatic and economic activities, not just military. China could ignore the ruling and justify its activities by passing a law declaring that the South China Sea, like Taiwan, has always been an internal region of China, and therefore international legal jurisdiction does not and has never existed, Tangredi said. In that line of thinking, the independence or foreign control of the territorial seas cannot be tolerated and actions by other states to assert control are illegal and will be treated as a criminal action. Any resulting resistance or attack on Chinese agencies exercising outside legal authority would be treated as an attack against the state. The analyst also said he fears China would declare an Air Defense Identification Zone (ADIZ) over the South China Sea in response to the court ruling. 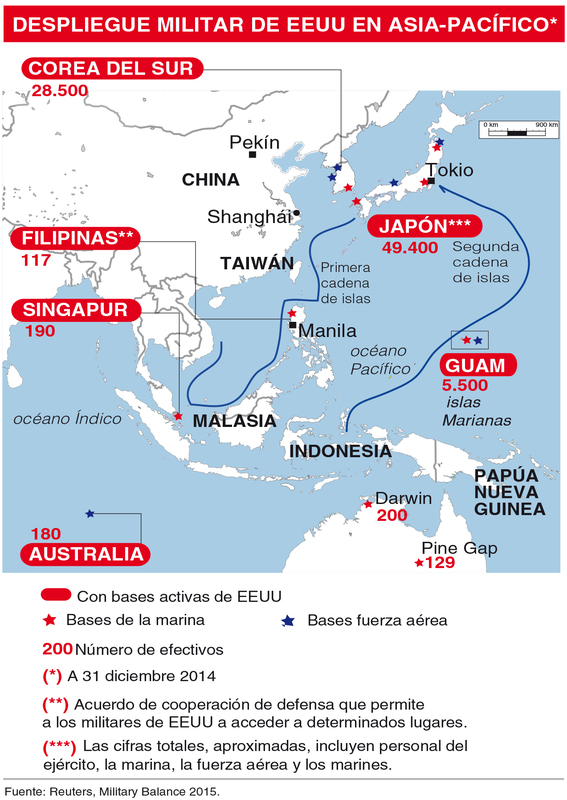 China declared an ADIZ over the East China Sea (ECS) in November 2013, rattling Japan and the United States. The ECS ADIZ overlaps the Japanese-administered Senkaku Islands, which China claims as the Diaoyu Islands. Wallace “Chip” Gregson, a retired US Marine and former US assistant secretary of defense for Asian and Pacific security affairs, said a new ADIZ in the South China Sea is a possibility, as well as other preemptive actions in Scarborough Shoal and Second Thomas Shoal. Andrew Erickson, a China military specialist at the US Naval War College, calls China’s fishing boat militia “China’s 3rd Sea Force” and capable of disrupting US freedom of navigation operations in the South China Sea. “For years now, China’s been surreptitiously pushing territorial claims against weaker neighbors using its maritime militia, or ‘Little Blue Men,’” he said. •2014: repulsion of Vietnamese vessels from disputed waters surrounding its HYSY-981 oil rig. The US government must “call out” China’s maritime militia in public and in conversations with Chinese interlocutors, Erickson argued. Washington must make it clear that any elements that ignore repeated warnings by US vessels to refrain from disruptive activities would be treated as military-controlled vessels, he added. The US government also should impose consequences for any use of the maritime militia against US vessels, according to the analyst. Queda ver cómo reaccionará China. Lamentablemente, no los veo acatando el fallo (basta con uno refererirse a la actitud del gobierno chino respecto a la propiedad intelectual, y a sus continuos cyberataques contra gobiernos foráneos, como para hacerse una idea de su falta de respeto hacia las normas). Me parece buen momento para que la USN pasee un Arleigh Burke por la zona -evidentemente con la venia del dueños legales de las aguas-, como para aclarar cualquier duda respecto al fallo. Last edited by Goliath; 12-07-2016 at 01:42 PM. El gigante asiático lanza el mensaje a través de medios oficiales. "Como Trump todavía tiene que jurar su cargo, China ha mostrado contención", señala el diario 'Global Times'. Rex Tillerson, nominado para la secretaría de Estado, ha amenazado al país de bloquear su acceso al mar de China. Si el equipo diplomático de Trump forma las futuras relaciones con Pekín como lo está haciendo ahora, "ambas partes deben prepararse para un enfrentamiento militar", advierte un medio estatal chino. 'Global Times', uno de los periódicos más importantes de China, ha advertido de que EE.UU. tendría que lanzar una "guerra a gran escala" para impedir que Pekín acceda a las islas que ha construido en el mar de la China Meridional, en relación a las declaraciones del candidato a secretario de Estado en el Gobierno de Trump, Rex Tillerson. Durante la sesión de confirmación del Senado este miércoles, el candidato a secretario de Estado en el Gobierno de Trump, Rex Tillerson, propuso una medida que puede provocar un serio enfrentamiento entre Washington y Pekín: que EE.UU. impida el acceso del gigante asiático a las islas en disputa del mar de la China Meridional. "Vamos a enviar una clara señal a China de que primero debe acabarse la construcción de islas y, segundo, que su acceso a ellas no se les permitirá", afirmó Tillerson ante los asistentes a la rueda de prensa. El periódico hace hincapié en que EE.UU. "no tiene poder absoluto para dominar el mar de la China Meridional", y advierte de que Tillerson debería "ponerse al tanto sobre las estrategias de energía nuclear si quiere forzar una gran potencia nuclear a retirarse de sus propios territorios". "EE.UU. no debe pensar que Pekín tendrá miedo de sus amenazas"
El medio señala que hasta ahora, como el presidente electo todavía no ha ocupado el cargo, China ha mostrado "moderación", cuando los futuros miembros del gabinete expresaron "opiniones radicales". Sin embargo, subraya que EE.UU. "no debe engañarse pensando que Pekín tendrá miedo de sus amenazas". Si el equipo diplomático de Trump forma las futuras relaciones sino-estadounidenses como lo está haciendo ahora, "las dos partes deben prepararse mejor para un enfrentamiento militar", asevera el artículo, añadiendo que las declaraciones de Tillerson están "lejos de ser profesionales". China se opone al posible suministro de fragatas lanzamisiles a Taiwán por parte de EE.UU. China se opone al posible suministro a Taiwán de dos fragatas lanzamisiles de Estados Unidos, ha declarado el portavoz de la Cancillería china, Hong Lei, informa RIA Novosti. "China se opone firmemente al suministro de armamento estadounidenses a Taiwán. Esta posición es coherente y clara", ha añadido. Según Lei, este tipo de acciones por parte de Washington interfieren en los asuntos internos de China, perjudicando el desarrollo de las relaciones entre Pekín y Taipéi (el centro administrativo de la isla), así como las relaciones chino-estadounidenses. En caso de aprobarse esta semana la venta de las dos fragatas lanzamisiles, se trataría del primer suministro militar a la isla por parte de EE.UU. en los últimos cuatro años. Es la fanfarronada de Tillerson o es sólo un bluff para el Senado? Nominado para el secretario de estado de los EEUU Rex Tillerson pronunció declaraciones asombrosas durante su audiencia de la confirmación con el senado el miércoles. Comparó la construcción de islas de China en el Mar de China Meridional a "La toma de Crimea por Rusia", y dijo que el nuevo gobierno estadounidense enviaría a China una señal clara de que "primero se detiene el edificio de la isla y segundo su acceso a esas islas tampoco va ser permitido." Debido a sus relaciones íntimas con el presidente ruso, Vladimir Putin, Tillerson es el candidato más polémico entre los nominados por el presidente electo Donald Trump para su gabinete y es considerado el más probable de ser vetado por el Senado. Se sospecha que él simplemente quería obtener el favor de los senadores y aumentar sus posibilidades de ser confirmado por mostrar intencionalmente una postura dura hacia China. Tillerson no dio detalles de cómo lograría sus metas autoproclamadas. Sin embargo, también mencionó que los intereses económicos de China y Estados Unidos están profundamente entrelazados y que "China ha sido un valioso aliado en la reducción de elementos del Islam radical". Señaló que "no debemos permitir que los desacuerdos sobre otros temas excluyan áreas para una asociación productiva". No está claro qué punto, entre los muchos que hizo, dará prioridad. Pero vale la pena mirar sus comentarios que China no debe permitir el acceso a las islas, ya que esta es la declaración más radical desde el lado de los EE.UU. hasta el momento. China tiene suficiente determinación y fortaleza para asegurarse de que su revuelta no será exitosa. A menos que Washington planea emprender una guerra en gran escala en el Mar de China Meridional, cualquier otro enfoque para impedir el acceso de los chinos a las islas será una tontería. Estados Unidos no tiene poder absoluto para dominar el Mar de China Meridional. Tillerson tendría que mejorar las estrategias de energía nuclear si quiere forzar a una gran potencia nuclear a retirarse de sus propios territorios. Probablemente sólo tiene los precios del petróleo y las tasas de cambio en su mente como ex CEO de ExxonMobil. También carece de legalidad. Si a China no se le permite el acceso a las islas desde hace mucho tiempo, ¿esto también se aplica a Vietnam y Filipinas? ¿Deberían las Islas Nansha convertirse en una zona despoblada? ¿Qué significa la llamada libertad de navegación estadounidense alrededor de las islas Nansha? Como Trump todavía no ha jurado, China ha mostrado moderación cada vez que sus miembros del equipo expresaron opiniones radicales. Pero Estados Unidos no debe ser engañado al pensar que Pekín temerá sus amenazas. Las declaraciones de Tillerson sobre las islas en el Mar de China Meridional están lejos de ser profesionales. Si el equipo diplomático de Trump da forma a los futuros lazos sino-estadounidenses como lo está haciendo ahora, las dos partes deben prepararse mejor para un enfrentamiento militar. Los países del Mar Meridional de China acelerarán sus negociaciones sobre un Código de Conducta. Tienen la capacidad de resolver divergencias por sí mismos sin la interferencia de EE.UU. Así como Filipinas y Vietnam están tratando de calentar sus lazos con China, las palabras de Tillerson no pueden ser más irritantes. Se espera que Tillerson desee una asociación productiva con China más y sus duras palabras son sólo persuadir al Comité de Relaciones Exteriores del Senado. Pero no importa qué, China siempre responderá a las diversas maniobras diplomáticas de Estados Unidos. El Ministerio de Asuntos Exteriores del gigante asiático considera la política de una sola China como la "base" de las relaciones con Estados Unidos. El Ministerio de Asuntos Exteriores de China ha condenado firmemente este sábado la sugerencia del presidente electo de EE.UU., Donald Trump, de que la política de una sola China sobre Taiwán es negociable, y la consideró la "base política" de las relaciones entre Estados Unidos y China. "El principio de una sola China es el fundamento político de las relaciones sino-estadounidenses y no es negociable. Exhortamos al lado relevante de Estados Unidos a reconocer la alta sensibilidad de la cuestión de Taiwán y a cumplir las promesas de las sucesivas administraciones estadounidenses de ambos partidos", reza el comunicado oficial de la Cancillería china. El magnate declaró este viernes en una entrevista que no se comprometería a un acuerdo a largo plazo entre Estados Unidos y China sobre Taiwán antes de ver progreso en la políticas monetarias y comerciales de Pekín, y agregó que "todo puede ser objeto de negociación, incluida [la política de] una sola China". China, por su parte, considera a Taiwán como una provincia rebelde y, desde 1979 Estados Unidos reconoce que Taiwán es parte de China y que las relaciones entre Estados Unidos y China se rigen por un conjunto de protocolos conocidos como la política de una sola China.